During August utilities works will close the Petersham Road to motor vehicles through Petersham village. This will affect both the 371 and 65 bus service, however the local councillors have advised that access will be maintained for pedestrians and cycle users. 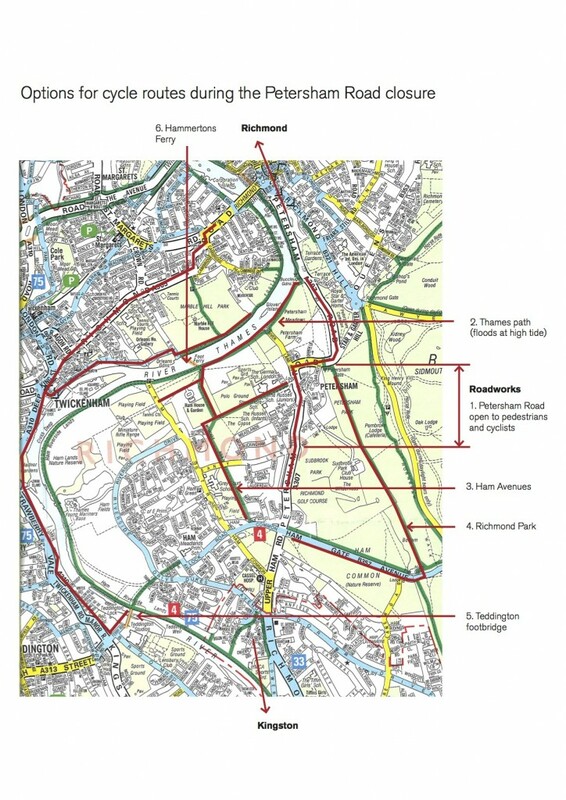 The Petersham Road is the only carriageway between Ham/ Petersham and Richmond and the sole public transport route making this a significant closure for residents and visitors. Allowing cycles to pass during the works will make this the fastest way to Richmond and beyond. Other potential routes for cycle users are primarily footpaths/ shared paths. The river tow path has recently been resurfaced between River Lane and Ham House. The Petersham Meadows stretch remains rather rough going for small wheels and thin tyres. The end of River Lane and some of the Petersham Meadows section floods at high tide. Check tide tables here as it can be a long detour if caught out. The Ham Avenues are level paths, frequently used by cyclists, pedestrians and dog walkers, however the loose gravel surface finds its way into the chain and mech when wet. They join the Petersham Road where the roadworks are located. The shared cycle/ footpath along the west boundary of the park can be used to bypass the roadworks between Kingston & Ham Gates and Petersham Gate. The inclines are relatively shallow but there is loose gravel on some parts. Pushing the bike over the bridge and cycling along the road parallel to the river gives access to Richmond through Teddington, Twickenham and St Margarets. The road has an advisory cycle lane in parts or you can opt for the riverside path beyond Orleans House. The Hammertons Ferry takes bikes for an additional charge. Crossings are not scheduled; waiting times vary.